We showcase granite as one of our premier stone materials here at Stone Masters because we are extremely proud of the options we carry. The Toronto market can be very competitive when it comes to home sales, so it is always a good idea to consider an upgrade when you can afford it. Our granite backsplashes, countertops and consoles would definitely fall into that category as we provide the best quality products at prices the average homeowner can afford. Our polished granite is a great stone surface to use when upgrading your tired kitchen or drab countertops and studies have shown that the two rooms in your house that benefit the most from upgrades or remodels when it comes getting a return on your investment are your bathroom and kitchen. For this reason we are excited to offer the following 18 different granite finishes, which are guaranteed to look fabulous in the parts of your house that will draw the most attention. We at Stone Masters send our international buyers all over the world to scout out locations for new and exciting granite options and they have a rigorous set of quality control standards that new stone must pass in order to be offered here on our website. Only the finest quality granite stone makes it back to our Toronto showroom and we would be happy to give you a personal tour or a virtual one if you give us a call. One of our trained customer service agents will be happy to discuss the options that might work bes t for you project. Many of them have backgrounds in interior design, so all we need is the layout, shape and a few colour options and we will put together a few granite backsplashes or countertops that are sure to meet your needs. Our granite comes in all of those beautiful finishes to bring you that polished and classic look, but if you are not 100% satisfied please give us a call and we can find a stone surface that is right for you. We also offer installation for the Greater Toronto Area. Our skilled professionals will install your granite right the first time and they won't leave until you are satisfied with the finished product. At Stone Masters we are dedicated to bringing you the best quality granite stone we can find and when you are ready to upgrade your backsplash, countertops or console, please consider us and our huge inventory of stone materials in the Toronto area. The bottom line is that if you want the best quality stone for your home projects, granite is an ideal choice and we bring more of the material to North America pound for pound than virtually any other company operating in Toronto. Should you be ready to add quality granite to your home, please give us a call. 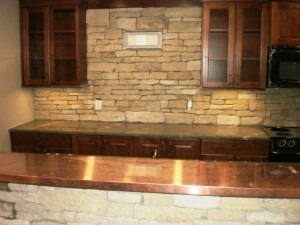 Stone Masters is proud to offer a selection of high-quality granite stone for backsplash projects in Toronto. If you want to create a natural looking backsplash in your kitchen or other areas in your house, granite stone is a great choice. Since the stone comes in a variety of colours, it has use in just about any kind of kitchen, regardless of the look you are trying to achieve. It can be made to achieve a variety of finishes, including traditional hand-tooled, shot-blasted, flame textured, honed, polished, etc. 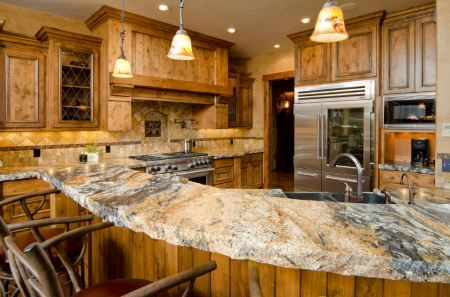 Why Choose Granite as a Backsplash Material? Granite has a natural elegance and durability that makes it ideal for many home improvement projects. 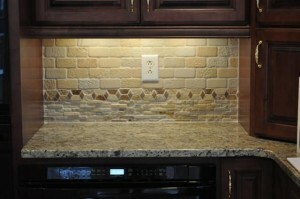 It looks great as a backsplash when combined with one of our marble countertops. It’s also a cost-effective choice. Even if you don’t have a high renovation or construction budget, you can still get a lot of value from granite stone tiles. It’s a hard stone that can withstand a lot of wear and tear, in addition to being resistant to scratches. Its water-resistance makes it a good choice of a backsplash material behind the kitchen or bathroom sink. If you have a drab countertop, creating a granite backsplash is a great way to add some colour and style to the kitchen. Marble and travertine aren’t for everyone – especially if you already have a marble or travertine countertop. Granite provides a nice contrast. Which Finish is Right for Your Needs? Granite stones are available in different styles, colours, finishes, etc. We offer a dozen finishes to choose from in various colours. Polished granite is an excellent choice if you really want an eye-catching backsplash. However, if the countertop and other kitchen design elements are already striking and bold, you might want to stick with a more subdued granite finish. A honed finish gives the stone a satiny, non-reflective appearance. Honed granite is a good choice for kitchens that have a lot of metallic fixtures and/or highly-reflective surfaces. If your kitchen has a lot of white or gray, you can add some contrast with an absolute black granite finish. It’s just as streamlined as soapstone, yet harder and more durable. If you want a white backsplash, ivory fantasy is always a classy choice, with its vanilla and eggshell hues and umber accents. Our dark emerald pearl granite is an appealing choice in kitchens with either light or dark colours. For a warm colour, you might find Juperano Colombo or Madura gold to be appealing. With so many variations of granite to choose from, you’ll be able to find the perfect stone tile to create the ideal backsplash. The tiles are available in all of the standard sizes. We might also be able to provide you with smaller sizes if you need them. Our line of natural stone products includes tiles and mosaics made with high quality craftsmanship. Most of the products we offer are manufactured at our own facilities in Toronto and Europe. We guarantee durability, longevity and versatility with our granite stone. Call or email us to let us know about your backsplash requirements, and we will help you select the right granite finish.